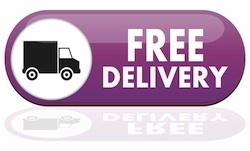 Free Delivery on All Orders from the AfroDeity Store! At AfroDeity we love to find new, novel products especially those we recognise from the Caribbean. We seem to have found this ins Sisays line of Okra and Flax products. Sisay International is a Dutch company that specialises in the care of curly, dry hair. 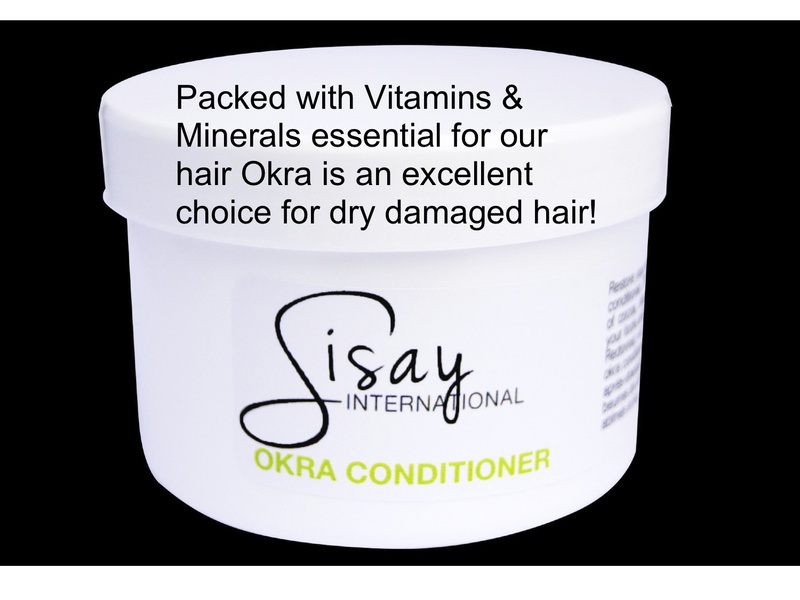 If you suffer from dry hair, hair loss or excessive dandruff these products are for you! 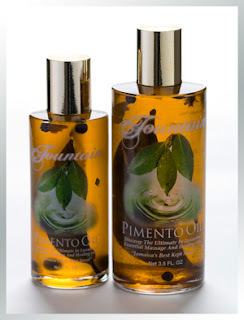 their products are based on natural ingredients that are free from harmful chemicals. Mild enough for use on children. Okra is a good source of vitamins A, B complex (B6, Thiamin) Vitamin B, C and E, iron and calcium. It is high in fiber, low in calories and fat free. Additionally Okra contains Folic Acid, calcium and zinc. Okra is very nutritious, not only as food but also for your hair and skin. 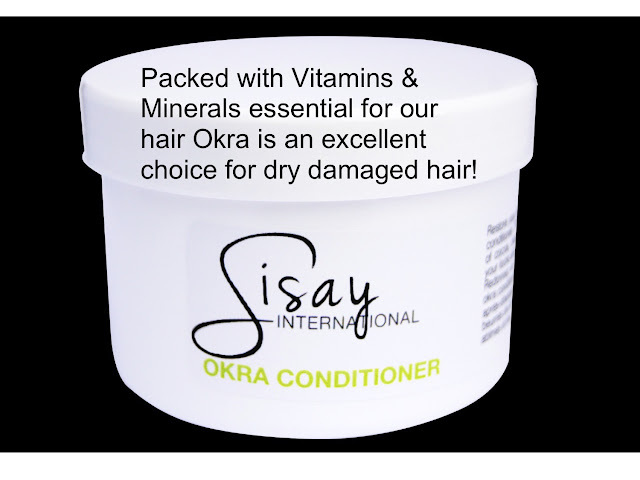 In many South and Latin American countries this has been used for strong, healthy and shiny hair. 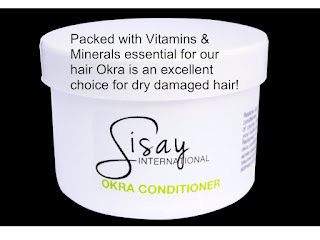 Some claim that regular use of okra grows hair stronger and also greatly stimulates hair growth. 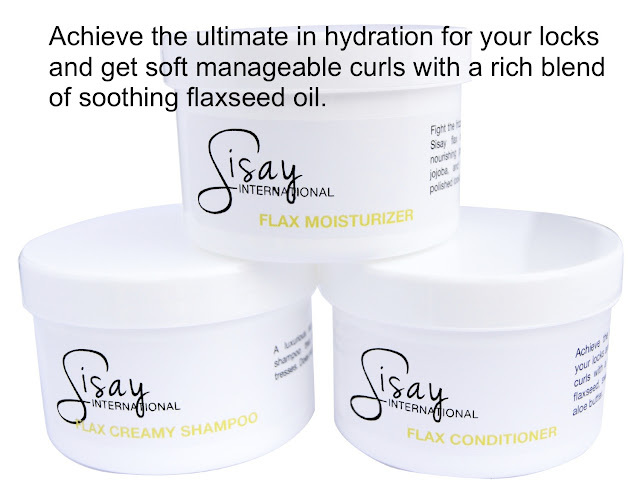 Look out from more from Sisay on the AfroDeity store Their Founder Janine Van Throo, loves interesting new and novel approaches to the care of curly, dry hair. Looking forward to brining you new information about the Hair Milkshake. SiShake. Sisay Inernational products are now available at AfroDeity! Get your flax and okra products from AfroDeity today! We really liked that Fountain Pimento Oil tis trying to help the Jamaican Farming Industry so we wanted to share their mission statement with you. “Fountain" ONLY manufactures organic, chemical, additive & preservative free health & beauty products from Jamaica. Advocating for natural pain-management tools and oils to nourish, grow and thicken ALL hair types. Our ultimate goal is to support the indigenous farmers and the rapidly declining agricultural industry of Jamaica. We STRIVE to encourage local cottage industries AND assist in the sustenance of poverty-stricken citizens. We, at Fountain are enriching lives, as well as helping to stimulate an otherwise third-world economy. 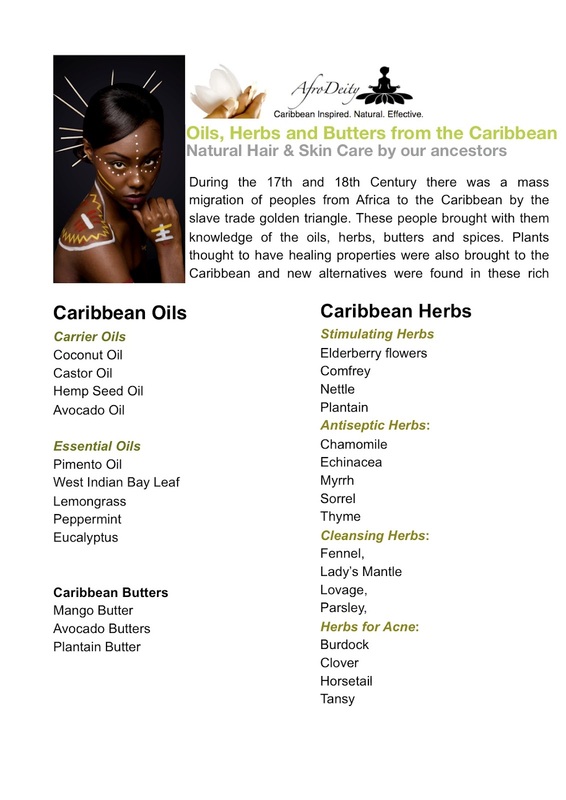 Embracing the traditional herbal remedies as still practiced in the Caribbean that are free from adverse medical side effects, using methods that have been passed down from their ancestors. Completely organic! Rural Jamaicans do not use fertilizers on their farms - no chemicals or preservatives, just real Jamaican sunshine! “Fountain” products, nurtured in Jamaica & bottled in Brooklyn use only the finest organic leaves, berries & barks. Fermented over time in extra virgin olive oil and castor oil processed the Jamaican way! We don't even discard the botanicals, they too are bottled! Our packaging IS not harmful to the environment and we endorse green living! SO ENJOY A “FOUNTAIN” PRODUCT TODAY AND HELP US TO CONTINUE TO SUPPORT MORE MICRO-ENTERPRISES IN JAMAICA! 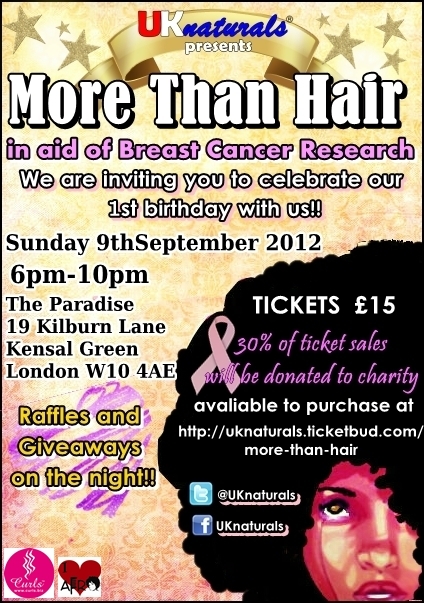 When I heard that UK Naturals was hosting an event called 'More Than Hair' I was intrigued by the title. Then I was even more intrigued when I found out that the event wasn't really to do with black hair! but was in aid of Breast Cancer Awareness. The idea behind the event is that as black women we are more than our hair. We need to do more than look after our outer beauty we need to look after our inner beauty too! The statistics of incidences of breast cancer in the black population by contrast to the white population are staggering. 45,000 women are diagnosed with the disease annually. While the majority of cases are presented and diagnosed in good time, around 20-30 per cent of women with symptoms of breast cancer wait three months before consulting their GP. Research has shown that although the incidence of breast cancer is lower in women of black African and black Caribbean ancestry, when they are diagnosed it is often at a more advanced stage and they have worse survival rates than white British women. A significant number of black women develop a more aggressive form of breast cancer. Black women are less at risk of developing breast cancer but for those that do develop breast cancer the outlook is worse than their white counterparts. It was also noted that the drugs used at the moment for breast cancer may not be effective on this more aggressive type of breast cancer as studies have not been done into this particular type of cancer that affects black women. As this research has highlighted this problem, treatments are now being investigated to treat this type of cancer. If more research confirm this study's outcome screening services offered to black women need to be altered to better reflect the age at which they are diagnosed with breast cancer. The reason for the differences between diagnosis times between the races is being investigated from socio economic circumstance, biological differences, cultural attitudes and geography. I am happy that the problem is being addressed but a little dismayed as to why has it has taken so long to even realise there was a problem at all. When you get in the shower, dont just check your strands, make sure you check for lumps too. It only takes a few minutes and it could save your life. Want to know how to do a self examination? Click the image below. Want to know more about UK Naturals Rachy & Naomi - See their blog here and their YouTube Channel Here and dont forget to buy your tickets. Starting at about 1.40min, Barbie, the (supposed) epitome of perfection with unattainable physical characteristics, appears out of the water with hair that bounces back to its original style. Poor Raquel (who is also trying to win the affection of Ken) gets out of the water and her hair blows up into an afro (a fierce looking afro at that). That wasn't enough though; a fish appeared out of her afro. Ken then says 'Raquel, you get the prize for wackiest hair'. This (subtle) jab at naturally curly hair is not uncommon but a rather regular occurrence in entertainment and media. It's not just black women who are natural who have to endure this ridicule; women and men of other races who have naturally curly hair have to endure this too. We live in a straight-haired world where straight hair is always associated with beauty and elegance... it's hair that appears to be taken care of. Many commercials represent everyday women and celebrities, that are struggling with their frizzy hair and they always find the solution. But the solution is in the form of straightened hair that appears smooth, shiny and healthy. These days the solution also takes the form of a perfect curl. The TV commercials, which advertise products for curly hair, advertise near perfect curls, which are always achieved through some form of manipulation using curl rollers and curling irons. Perfect and uniform curls are hard to find on an individual. Most people have more than one type of curl or hair types. Besides, unless you have a type of curling technique down to the T, you won't really get any of the results many of the TV commercials present. Moreover, professional hair stylists achieve those results; it's hard to believe everyone has one in their home. Hair companies should ideally promote people maintaining their own hair in its natural state and not promote people maintaining a temporary or an even permanent style, which can cause damage to your hair. Many hair companies have TV commercials, which also offer temporary solutions for 'damaged hair'. This is hair that is damaged because of heat, hair dye or chemicals. These companies also claim that your hair will look healthy; what's the point of having hair that isn't even healthy? You can't repair split ends. Every time I see a commercial claiming that a certain serum or shampoo will repair split ends, I'm hoping that someone won't buy it. You're better off cutting off all of the split ends. Hair companies are profiting off of this idea that split ends can be repaired. Many mainstream hair companies aren't even offering permanent solutions to temporary problems. They have to make money and they need people to keep buying so it's no surprise. The John Frieda's Frizz-Ease range is notorious for commercials showing ladies with big curly hair or frizzy hair who appear to be unhappy and/or uncomfortable with it. They find the solution to this and their hair is made smooth, shiny and straight or perfectly curly. The individuals appear happy and more confident. Exhibit One - A John Frieda Frizz-Ease commercial. 'Transform dull hair to into sleeker and shinier hair'. To many, frizzy hair is synonymous with curly hair. This is offensive to many people because there is a clear difference between frizzy and curly hair. 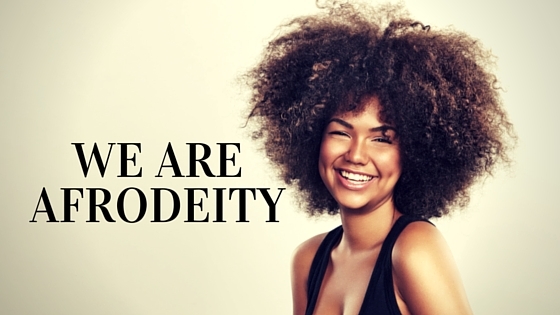 It is true that curly hair is prone to becoming frizzy because of humidity issues or dryness and damage, but curly hair is not frizzy hair and frizzy hair is not curly hair. Companies are promoting frizzy hair solutions in the form of a perfectly curly, wavy or straight hair and not the natural hair type. Can I see a commercial where a person with frizzy hair has used an anti-frizz potion of some type and just kept their natural hair pattern? Does hair always need to be styled? I suppose I have to keep in mind that hair companies are trying to sell their products. Their products need to appeal to the consumer and the results need to be desirable. Their products may not work for you. Their ingredients may also be incomprehensible and during commercials, the fine print sometimes says they're wearing extensions. The photos and/or videos of the commercials are Photoshopped and taken at an angle with a lot of professional lighting; keep in mind that your hair may not look that shiny, silky or smooth.